"My guitar sound is not coming out of my amplifier!" The guitar is not plugged in. The amplifier is not turned on. The volume knob is turned down. There may be internal wiring issues. "Why do the strings sound horrible?" The strings are too high or low on the neck. "I put new strings on and they still will not hold their tuning!" New strings need to be broken in. The tuning heads have become stripped. "There is always a crackling sound when I play!" Your cable may be broken. There may be an internal wiring problem. The pickups may need replacing. When many people think of an electric guitar, Fender guitars often leap to their minds. The Starcaster is an instrument based off of the Fender Stratocaster—one of the world's most popular guitars and an elegantly versatile creation that is both a musical and cultural touchstone. At its heart, though, the Starcaster remains a fantastic tool. Its unmistakable sound and timeless design has made it a great choice among players worldwide. You strum your guitar and no sound comes out of the amplifier. Check to make sure that your guitar is plugged into the amplifier. Check to make sure that your amplifier is plugged in and turned on and that the volume is turned up. Ensure that the volume knob is turned up. This may include wiring between the pickups, the pickup selector switch, the potentiometers, or the output jack. 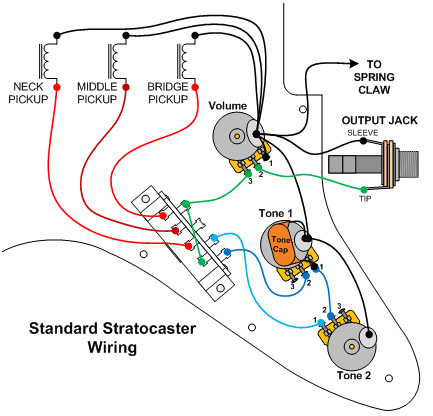 If the wiring is correct, and the solders are clean (no broken wires too), then it could be a bad switch, bad volume pot, or a bad cable from your guitar to your amplifier. Your strings have a dull sound, or do not hold a tune. Sometimes when strings age, they lose their lustrous sound, and have trouble holding a tune. You may need to change the strings. If the strings are too high or low on the neck, you may hear a buzzing sound while fretting the strings. This may be fixed by adjusting the bridge saddles, or by changing or replacing the bridge. You have changed your strings but they keep going flat or sharp. After a fresh string change, there may be slack on the strings. The strings have a tendency to stretch slightly, and may just need to be tuned a couple of times more. If you have broken in your strings, and they still do not hold a tune, or if you visually observe the tuning heads turning on their own, you may need to replace your tuners. You're plugged in, the amp is on, but there is this horrible crackling occurring while playing. If you hear a crackling sound often, check your cable. You may try using a different cable. If you have changed your cable, and the crackling persists, you may need to fix the internal wiring. Through frequent use, the output jack can become worn out. The volume knobs and selector switch can also become dirty or worn out. If all else fails, one or more of your pickups may need replacing.